Former Music Director Mariss Jansons returns to Amsterdam to conduct Pique Dame at the Dutch National Opera with "his" Royal Concertgebouw Orchestra. He encounters a noteworthy cast and under his baton the orchestra sounds "brilliant and splendid" (Der Tagesspiegel). Renowned director Stefan Herheim staged Tchaikovsky's much-loved opera about a young man who, for the prospect of earthly wealth, gambles away his chance for love and happiness. Herheim, whose stagings are famous for their multi layered levels of interpretation, attempts to reflect on the composer's hidden love for men. "The Latvian maestro, the intriguingly performing orchestra, the smartly-chosen soloists, and director Stefan Herheim have succeeded in staging an extraordinary production" (Die Presse). 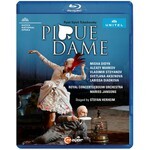 "Stefan Herheim makes a great picture show out of Tchaikovsky's 'Pique Dame'" (NMZ). "A masterpiece" (Der Standard).